Professional Sound Corporation® SC-4 Sound Carts have been used in film and video industries for the last 20 years. This ruggedly built cart provides a strong, stable and easily moved work area for sound recordists the world over. This equipment cart is constructed of aircraft quality aluminum and are TIG and MIG welded to provide years of trouble free use under harsh field conditions. Its finish is a tough, U.V. resistant, powder coat paint for durability and appearance. The PSC SC-4 Sound Cart is equally compatible when used with video equipment. Its five way adjustable shelves fold up for shipping and storage. The PSC SC-4 Sound Cart will provide a rugged, reliable and convenient method of moving your equipment from scene to scene for years to come. A one year, limited warranty is provided. 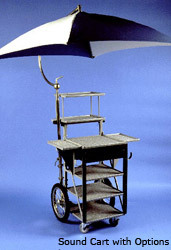 The PSC SC-4 Sound Cart has many options available to allow the user to custom tailor the cart to their specific needs. These include: full length rack rails, 2, 3 and 4 space rack drawers, removable side shelves, auxiliary top shelve, additional cable hooks, headphone hangers, shelf carpet, molding, umbrella/sunshield and more. There are many available options for the PSC SC-4 Sound Cart. Please contact our sales staff for the many, many options available to customize the cart to your specific needs. 18" x 20" x 46"